Throughout his life, Eymard was acknowledged by many of his contemporaries as a holy person. When he died in 1868, his followers immediately began to hail him as a ‘saint’. They were confident that, from the moment of his death, Eymard would be sharing in eternal life with God in heaven. Formal recognition of Eymard’s sainthood by the Catholic Church took much longer. By the mid nineteenth century, a strict system of juridical investigation had evolved in the Church to test and regulate the public acclamation of saints. As a candidate for sainthood was shown to have satisfied the rigorous requirements of various stages of the process, specific titles were progressively bestowed, each of these titles signifying stages in the Church’s growing recognition of the candidate’s sanctity. A candidate’s life had to demonstrate ‘heroic virtue’. The process also required evidence of posthumous miracles that were attributable to the candidate’s intercession. Posthumous miracles supported the belief that the candidate was in heaven. To help protect against error, the Church developed a healthy scepticism for miracle claims. 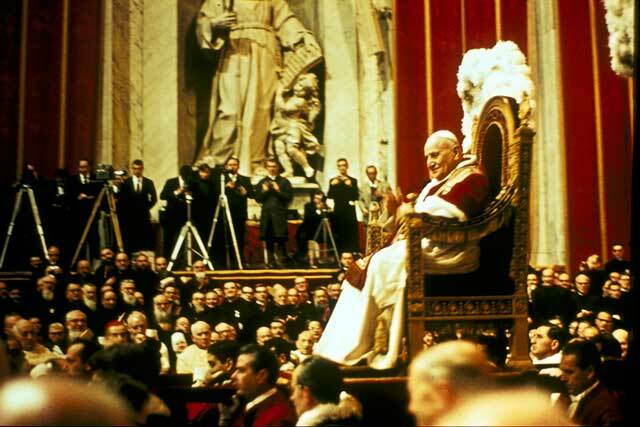 If all requirements were satisfied, the apostolic process culminated in a declaration or ruling by the pope called ‘canonisation’, deriving from the Greek word kanōn (‘rule’), whereby a candidate was declared by the pope to be a saint in heaven. 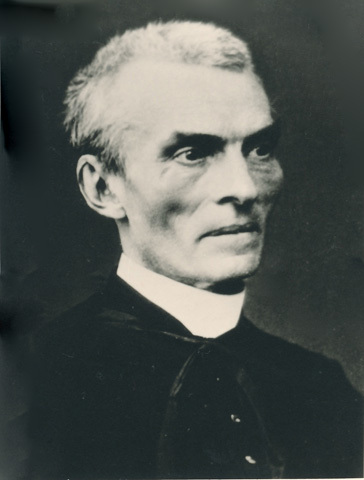 Peter Julian Eymard’s path to canonisation within a century of his death was relatively rapid by the standards of the Church. In the mid-1880s, Fr Edmund Tenaillon SSS was appointed the first ‘postulator’ of Eymard’s ‘cause’ (or case) for sainthood. Diocesan tribunals began gathering evidence about Eymard’s life. By 1902, thirteen volumes of testimony had been sent to Rome. After consideration by the Sacred Congregation of Rites, Eymard’s cause was accepted in 1908 by Pope Pius X, who declared Eymard ‘Venerable’. Eymard’s intercession was soon being attributed to two medical miracles. The first of these was the cure of Lucinda Cifuentes of Santiago, Chile from stomach cancer on 30 April 1916. The other was the cure of Renée Fouchereau of Angers, France from tuberculosis of the knee on 17 January 1919. Both cases had been considered incurable by medical experts. By 1922, Eymard’s virtues had been investigated and accepted as ‘genuinely heroic’ by the Sacred Congregation of Rites. After investigation and acceptance of the 1916 and 1919 cures as miracles due to Eymard’s intercession, Pope Pius XI beatified Peter Julian Eymard on 12 July 1925. The title ‘Blessed’ was bestowed on Eymard at that time. Two additional posthumous miracles were still required to be accepted by the Catholic Church before Peter Julian Eymard could be canonised a saint. (Nowadays, only one miracle is required to be accepted before beatification and another before canonisation.) During the late 1940s, two remarkable medical cures emerged as possible miracles associated with Eymard’s intercession. The first cure occurred on 29 May 1948, after a series of novenas requesting the intercession of Blessed Peter Julian Eymard, when Fr Charles Verdier of Bourges, France was spontaneously cured of chronic tuberculosis of the left foot. The second cure occurred on 3 August 1949, the final day of a Solemn Novena to Blessed Peter Julian Eymard at St Francis’ Church in Melbourne, Australia, when Dora Bartels was spontaneously cured of a heart condition (mitral valve stenosis) which was deemed medically incurable at that time. 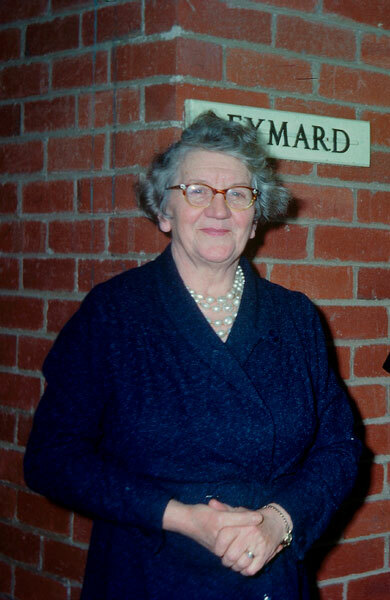 Dora Bartels, pictured outside the Bartels’ family home in Melbourne (renamed ‘Eymard’ after her cure). During the 1950s, stringent apostolic processes investigated the validity of the Verdier and Bartels’ cures. In 1956, Pope Pius XII called for further study of the Bartels’ cure. The Sacred Congregation of Rites then requested additional medical checks and reports from Melbourne. These reports confirmed the earlier evidence that Dora Bartels’ cure was genuine and inexplicable by the contemporary standards of medical science. Early in June 1962, there was news from the postulator of the cause at that time (Fr Henri Evers SSS) that the Bartels’ cure had been acknowledged as a miracle at a meeting of the College of Cardinals. On 15 July 1962 a Decree of Approbation was issued, declaring the miraculous nature of both the Verdier and Bartels’ cures, and on 22 September 1962 it was announced that the canonisation of Blessed Peter Julian Eymard could proceed. Eymard’s canonisation was scheduled at the end of the first session of the Second Vatican Council on 9 December 1962. As a result, about sixty cardinals and over two thousand bishops were present for the three-hour ceremony at St Peter’s Basilica in Rome. 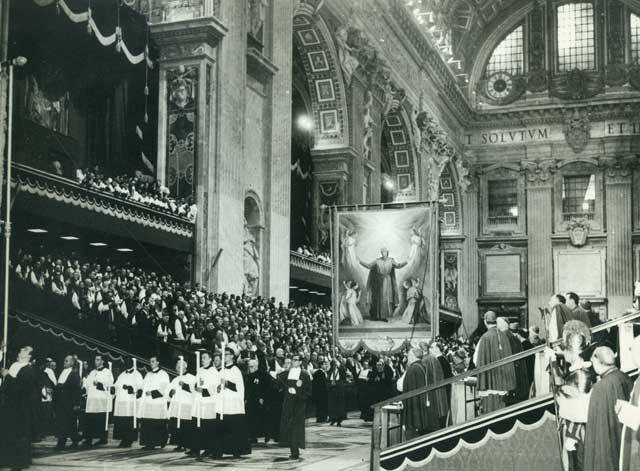 The banner of St Peter Julian Eymard is carried into St Peter’s Basilica by members of the Blessed Sacrament Congregation on the day of the canonisation of their founder, 9 December 1962. The Servite priest Anthony Mary Pucci (1819-92) and the Capuchin lay brother Francis Mary of Camporosso (1804-66) were also canonised with Peter Julian Eymard on 9 December 1962. This triple canonisation was later described by the Blessed Sacrament Congregation’s Superior-General Roland Huot as ‘the most extraordinary of all canonisations in the history of the Church, by reason of the attendance of so many cardinals and bishops’. In his homily during the solemn ceremony of canonisation, Pope John XXIII eulogised Eymard, hailing him as the ‘friend of the Eucharist’ and ranking him alongside the great French saints Vincent de Paul, St John Eudes and the Curé of Ars (St Jean-Baptiste Vianney) whose beneficial influence had extended far beyond the country of their birth. Pope John also recalled his own visit to Eymard’s house in La Mure many years earlier. Pope John XXII at the canonisation ceremony, 9 December 1962. The Decree of Canonisation read by Pope John XXIII in 1962 determined that Eymard’s feast day was to be celebrated in the Catholic Church on 1 August (the date of Eymard’s death). Before the canonisation, the feast had been celebrated on 3 August. The date was changed again in 1995, when Pope John-Paul II declared that Eymard’s feast day was to be inserted in the General Roman Calendar and celebrated each year on 2 August. St Peter Julian Eymard is known today as the ‘apostle of the Eucharist’. 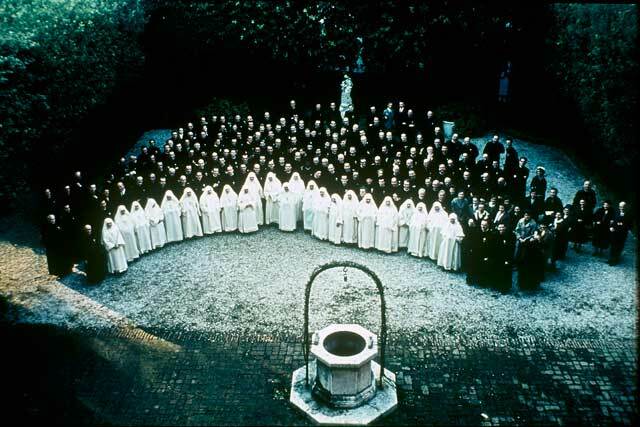 Members of the Blessed Sacrament Congregation and the Servants of the Blessed Sacrament in Rome for the canonisation of their founder, December 1962. Decree of Canonisation : 9 December 1962. Homily of Pope John XXIII: Canonisation of Peter Julian Eymard, Anthony Mary Pucci and Francis Mary of Camporosso, 9 December 1962. To view video full-screen (recommended), click the double-arrow button at lower-right of the player (visible on hover after the video commences). Press the escape (esc) key on your keyboard to return to this web page.